This grand home offers you luxury living with incredible views and amazing sunsets. The impressive two-story entry welcomes you home. Soaring ceilings, walnut floors, custom built ins and plenty of windows. Gather guests in one of the family rooms, media room or rec room. Gourmet kitchen with high end appliances, granite counter tops and butlers pantry. Spacious owners suite offers a spa bath by the fireplace and walk in closets. The spacious heated basement garage is great for dirt bikes, storage or a workshop. Enjoy grilling at the outdoor kitchen, entertaining on the two-tiered deck or taking a swim in the in-ground pool. The spacious heated basement garage is great for dirt bikes, storage or a workshop. A private setting by the historic Alligator Mound nestled in a great neighborhood. 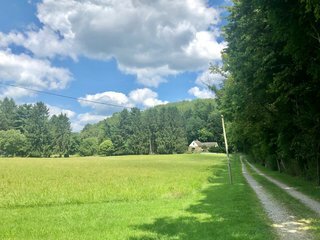 22 acres in the village offers a great development opportunity! This property has two dwellings. The home features 2-4 bedrooms and 1.5 bathrooms with gas heat and central air. The carriage house/apartment offers 2 bedrooms ,1 full bath and appliances with window a/c units and electric heat. Each one with its own garage. The private driveway leads you back to this secluded setting and the possibilities here are endless. Being sold as is, seller will not make any repairs. New custom built home by Stone Pillar Construction in the Village! This fabulous 2350 sq ft, 3 bdrm, 2.5 bath, new build offers quality finishes and a desirable floor plan. Gourmet kitchen is open to dining and living spaces. First floor master suite and laundry/mud room. Numerous windows and doors allow tons of light and easy access to the deck or patio for outdoor relaxing or entertaining. Attached 2 car+ garage is a rare feature in the Village! Located minutes from all major highways and walking distance to parks, shops and dining. Spacious 1 owner custom home in the highly desirable Reserve of Granville. Fantastic floor plan with an impressive outdoor living space that you must see to believe. The1st level of this house has a formal dining room, office, den or 5th bedroom, gorgeous 2 story living room with wall of windows, fireplace, and a mudroom with laundry & sink. There is an amazing kitchen with eat in dining area, island with seating space, granite,HW floors and a fabulous screened in porch! Upstairs there is a large Owner's Suite with beautiful high ceilings, a soaking tub and separate shower. Step outside to the newer outdoor living space with a huge dining area boasting gorgeous granite tops,an XL Green Egg smoker and Twin Eagle 42 inch gas grill with rotisserie! Plus 3 car garage & basketball hoop! MOVE IN READY! Stunning Bryn Du home w/spectacular location on a corner lot nestled on a quiet cul de sac & close to downtown Granville shops/restaurants. Expansive lush backyard with an extra lrg patio. Architectural excellence thru out: Cathedral foyer w/open expansive flrpln. Extra lrg great rm w/floor to ceiling windows open to the kitchen & eat in morning room. Entry level private study w/built-ins adjacent to an additional flex rm/den & updated dining rm. Perfect for entertaining & family gatherings. Expansive owner's suite w/updated spa bath & lrg walk in closet. Addl luxury features incl: Spacious family bdrms, upper level laundry rm, finished lower level w/lrg family rm, wet bar, exercise rm, 5th bdrm & full bath. Recent updates: fresh paint thru-out & new light fixtures. This home features 3 fireplaces, radiant floor heat, 5 bedrooms & 3 bathrooms. The main floor, with 9'-6'' ceilings, has a living room with exterior doors that open onto porches to the north & south that feature stone floors, ornate columns & trim. A new kitchen & family room were just completed. Flooring & most trim on the 1st floor is the original Chestnut. The hall staircase is the original Cherry. The 2nd floor has 8'-6'' ceilings, a master bedroom, a master bath & a walk-in closet. Bathrooms have marble floors & shower tiles that were custom made by a local artist. The washer, dryer, tv and remaining furniture can be included in the sale. Stunning village home with charm and character of a historic home and freshly updated to meet the needs of today! Fabulous location on quiet street near Denison and in walking distance to all the Village has to offer, this well maintained home has an abundance of light, hardwood floors and crown molding, dual staircases, balconies and tiered deck that overlooks private, park-like .41 acres. Unique and flexible floor plan offers a first floor master suite, a walk out lower level and a 1 car attached garage. Must see to appreciate all this home has to offer! A beautiful brick home with spacious rooms. The living room features a soaring stone fireplace and plenty of windows for natural light. The gourmet kitchen offers a large island, plenty of cabinets and a area for seating. New refrigerator, newer dishwasher and stove. Updated light fixtures in the formal dining area, kitchen and most of the bathrooms A first and second floor master bedroom. Fresh paint in the kitchen, bedrooms, and bathrooms. Some new windows, decking and a partially finished basement with a bar. A wonderful neighborhood with fantastic neighbors and just minutes from the Village. These are just some of the many features this home has to offer. This stunning home is located in the Granville school district with 4 bedrooms, 4 1/2 baths and plenty of space to entertain inside & out! The inside boasts an open concept with an abundance of natural lighting from the many large windows & doors, beautiful granite countertops in the kitchen and a second floor laundry! The large built in bookcase in the living room adds charm & character! 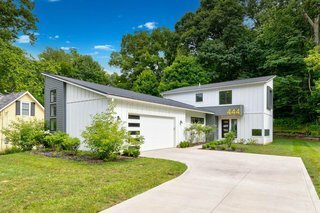 Step out onto the wrap around, covered deck to relax and enjoy the peaceful view of the 3.90 acres included or exit from the lower level walkout to enjoy the inground, salt water, heated pool, beautifully landscaped! Many updates include a new roof 2 years ago, a new furnace & HVAC 3 years ago, a new gas range and much of the interior of the home has been freshly painted recently. See A2A. The country is calling your name! This gorgeous cape cod features 4 bedrooms, 3.5 bathrooms, fully finished basement complete w/man cave, 2 laundry rooms, screened in porch, newly updated kitchen w/stainless steel appliances, subway tile & quartz counter tops leading into the 22 x 22 family room that overlooks the park like setting of just over 3 acres of land complete w/a running stream. 1st floor Master En Suite & laundry. The private back has a screened porch, patio w/Hot Tub & Fire Pit. The views are breathtaking from every room of the house & you will feel like you are on vacation every time you come home. Updates include Roof 2013, Patio & Fire Pit 2014, Furnace 2015, Kitchen remodel 2017, Family Room Stone & Built ins 2018, Hardwood Floors & Guest Bath Remodel 2019. See A2A remarks. Beautiful inside & out! 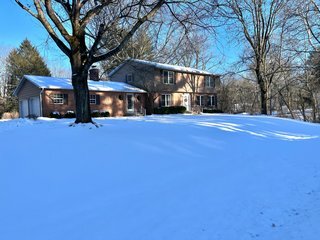 Great setting on 1.29 wooded acres, backing to a ravine. Exterior & Deck freshly painted in April. Outstanding 3 Season Rm w/ a cathedral wood ceiling & walls of windows w/ panoramic views! Attractive Hickory HW floors on the main lvl. The updated Baths ('19), expansive Loft, vaulted FR w/ gas fp & a partially fshd walkout LL w/ French Doors are just several of the features you'll love! Open Kitch w/ large, multi-lvl island w/ granite & solid surface ctrs, cherry cabinets & SS appls. Spacious Owner's Ste incl an attached Bath w/ dual w/i closets and heated, marble floors. Ample storage space throughout. Whole house generator, newer driveway ('17), newer roof ('14), updated landscaping & new retaining wall ('17). Back storage for lawn equipment & more! This home is in ''Pristine Condition.'' Sensational 4 BR home w/ 3 full baths & 2 half baths. Beautiful NEW KITCHEN with white cabinetry, granite counters, oak floors, and new appliances. Nice dining rm w/ oak flrs, wainscotting & crown molding, lg family rm w/ wood-burning fireplace, new carpet, built-in bookcases & atrium door leading to fantastic deck for entertaining. Big living rm/ new carpeting chair rail, 1st flr guest bdrm or office. 3 spacious bdrms up w/ new carpeting. Owners suite has master bath w/ LG shower, soaking tub, new skylight, dbl vanity, & ceramic flr. Lower level features 1,328 sq ft w/ finished rec rm, exercise area, wet bar, & craft rm. Superior grade mechanicals, mitigated for radon, poured bsmt walls, and Andersen windows. Stunning Granville home on 1.5 acres. Beautiful vaulted living room with a floor to ceiling stone fireplace and plenty of windows. The gourmet kitchen features ss appliances, ample cabinets and granite counter tops. There are 3 spacious bedrooms and a bonus room/office. The 4+ car garage with a wood burning stove and car port makes for a great workshop. Outdoors entertain on the large deck or under the pergola. Come see everything this home has to offer. Great home on five acres in Granville Schools. Updated bathrooms, newer carpet in bedrooms, and lower level. Two family room/living room areas. One gas fireplace and one gas stove. A spacious kitchen with plenty of cabinets and counter space. Large deck off the dining area with wonderful views. Four bedrooms and three updated bathrooms. A large covered front porch to sit and relax. Granville Ohio cape cod designed condo with over 2,300 square feet of living area, perfect for entertaining or house guest. Main level includes living room with vaulted ceilings and skylights, formal dining room and kitchen with all appliances. Main level owner's suite, large walk-in closet and bathroom. Second floor features large loft area for family room, home office or game area, two large bedrooms with dormers and bathroom. Screened porch, attached two car garage, private location within complex. Monthly fee includes water/sewer, structure insurance, exterior building maintenance, snow removal, lawn care, club house and trash. Short walk to walking path to Granville Village business district. Rare opportunity to own a 3-bedroom, 2 bath condo in Granville's Erinwood Condominiums with over 2,300 square feet of living space, with a screened in porch!! This floor plan offers a generous first floor master suite with two large bedrooms and a loft area upstairs. All bedrooms have large walk-in closets for plenty of storage. Beautiful laminate wood floors grace the main level living areas, master bedroom, and closet. Newer refrigerator (2018) and microwave. Living area freshly painted. Tucked back in the complex, it feels very private. Maintain your active lifestyle by enjoying activities in the clubhouse, as well as the walking path that leads to town. The stair lift will stay, unless removal is requested. A darling hillside retreat with beautiful views! This charming 3 bedroom home is just a few miles from Downtown Granville, but has the feel of a secluded cottage. The kitchen features stainless steel appliances, a butcher block island & a wood burning stove for heating or cooking. Lots of character with exposed brick & shiplap accents. A spacious dining room is open to the kitchen. The family room features a wall of windows which bring the outdoors in. Adding more charm & character to the property, a 2 car, barn style garage includes an upstairs loft with windows & great potential to finish the space as desired. Newer windows, electrical panel, AC, & heat pump. Newly widened driveway with extra parking area. More beautiful views from the outdoor living space!